Smart kitchens. Everything is getting smarter, including your appliances. Smart refrigerators, which keep an eye on your dairy and produce for you and let you know when food is going bad, are especially popular for new construction and kitchen remodels in Fort Collins. Streamlined surfaces. Sharp corners and blocky kitchen designs are out in Fort Collins, replaced mostly by streamlined surfaces and counter tops with softly rounded corners. Wavy edges and seamless kitchen islands are also getting popular, especially with quartz surfaces, which are starting to overtake granite counters in Colorado kitchen remodels. Dark tones. Kitchens of the past were generally done in bright colors. Whites, yellows and shades of cream have been popular kitchen paint schemes for nearly a century. Some of the new kitchen designs in Fort Collins, however, are breaking that tradition with darker tones and even some jet-black surfaces. Some of this is to go better with darker toned appliances, while in some places it’s a conscious design choice to get away from tradition. Dark tiles are getting popular for floors, as are some of the darker hardwoods. Black paint may not be popular (not yet, at least), but tones of umber, mahogany and ochre are finding their way into a lot more kitchen designs in Fort Collins than they used to. Big backsplashes. Backsplashes have been changing a lot lately. 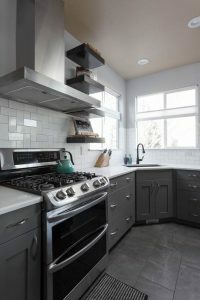 From the 1×1 tiles that were popular decades ago, and the laminate that used to be the default kitchen design in Fort Collins homes for years, homeowners are gravitating toward something a little more showy and eye-catching. Backsplash tiles have been getting steadily bigger over the years, with 4×4 stone tiles currently all the rage, and some solid-slab stone installations gaining traction. If you have questions about kitchen remodeling in Fort Collins, give us a call for advice and a free consultation. We have years of experience in kitchen design in the northern Colorado area and can help you understand the kitchen remodeling options available to you.